Bearing Drift’s Shaun Kenney Has Major Islamic Refugee Egg on his Face after Roanoke Beheading Attempt | Virginia Right! I knew it wouldn’t take long. On August 4th, Drifty Boy Shaun Kenny wrote an ill conceived post ridiculing people who have expressed concern at the influx of Muslim Syrian refugees into Virginia. Specifically – Roanoke. When I read the post that was sent to me by a friend (I never read that RINO / Establishment blog) I knew Kenney would eat those words sooner or later, probably sooner. Note: If you want to read the article, do me a favor and read it on the “Way Back Machine”. I care about my readers and wouldn’t want to subject you to the real site. Nor do I want to send them any traffic. The link on the Way Back Machine is here. But if you are a glutton for punishment and want to read it from the donkey’s mouth, here is the link to the Drifty blog. But there is a high likelihood that after I expose the laughable post by Kenney, the post will be deleted to avoid the ridicule. But they do not control the archive. Kenney’s article is rife with ridicule and his “holier than thou” attitude is in full peacock mode as he makes fun of the sane citizens of Virginia and Roanoke for having concerns about the influx of 21 Syrian “refugees”. I mean look — just look — at what 21 Syrian refugees did in a mere matter of seconds after they arrived in Virginia. To the contrary! Now is the time to PANIC!!! I mean, what must downtown Roanoke actually look like right now?? Oh right… it’s freakin’ gorgeous. Of course, Roanoke doesn’t look like Aleppo in the slightest. Virginia’s acceptance of 121 refugees in a population of 8.3 million hasn’t bothered anyone at all. Syrian Christians who are toughing it out in Syria still are begging for help from the Obama administration — and such cries are falling on deaf ears. Meanwhile, ISIL’s war of purity against Muslims themselves is devolving to a brutal conclusion at the hands of al-Assad and his Russian sponsors. Virginia can afford to lift its lamp beside the golden door. Anyone who is concerned at all about bringing in hundreds of mostly young, fit, male Muslims from a country that has been the hot bed of terrorism for centuries is, in Kenney’s opinion, an idiot. It didn’t take more than a couple of weeks after Kenney’s asinine post for the echos of “Allah Akbar” uttered from a knife wielding terrorist to break the calm and peace of a Roanoke apartment complex as a couple were attacked at random. 20-year-old Wasil Farooqui not only attacked the innocent couple, but apparently was intent on beheading the pair. 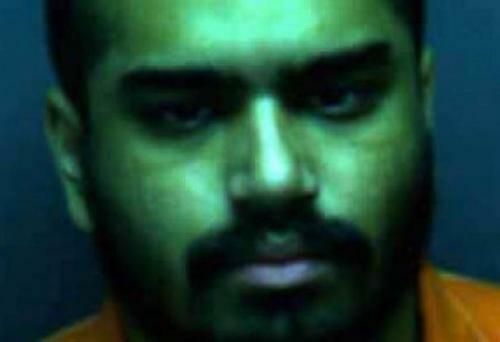 Both the stabbing victims and witnesses said Farooqui yelled “Allah Akbar” — Arabic for God is Great — during the attack WDBJ reported. The man and woman were attacked as they entered the apartment complex. Both survived the attack, but needed to be hospitalized due to their injuries. That source told CBS News that Farooqui first appeared on law enforcement’s radar after he tried to go to Syria earlier this year before returning to the U.S.
Farooqui was arrested when he showed up to the emergency room for treatment, CBS News added. But do you think Shaun Kenney will issue an apology for being so wrong and for being such a jerk for ridiculing people with a concern that this exact scenario was inevitable, the incidences in all mathematical probability increasing with every new batch of Muslim (Never Christian) refugees, most battle hardened and pre radicalized? The best advice, protect yourself. There are enablers all around and Kenney’s Alinsky techniques of ridicule only work if the fears are unfounded. Just ask the couple who are in the hospital just how accurate people like Kenney are in downplaying the danger from this suicidal exercise in self destruction. As a Navy Vet I can tell you, when a group of crazy people declare war on you, kill in the name of their deity all over the globe and say they are coming for you, I freaking believe them. And all Americans should will believe them too. When enough blood is spilled. ← Time for Sensible Americans to Take a Good Look at the Olympic Basketball situation: It’s a disgrace! The political left has been almost too clever by half in the not so subtle manner with which they chastise and berate anyone who takes a hard line on immigration from nations and war torn areas well known to harbor people intending on doing America harm. Take for instance the use of the term ” alt-right” ? I do not know exactly when/where this term originated, but I hear it now with increasing frequency and it isn’t used in a flattering manner, but often used to deride conservatives that have the view that borders, culture and language must have meaning if a nation is to retain it’s identity or sovereignty . I , as have many others have pointed out in the past that political correctness has among it’s many less than virtuous outcomes the effect of attempting to silence critics of foreign policy and immigration issues using this new term ( alt-right) as a weapon of choice in their efforts. Those of us with enough common sense to see the destructive nature of allowing people into this country that clearly have ill intent won’t be cowered by language. “Alt-right” is a term that the movement itself coined, and continues to embrace and identify as. To the extent it is not used in a flattering manner is the extent to which the movement does not lend itself to flattery. There has been a long and by no means rational rhetorical tradition at the Bearing Drift Blog over time to resort to accusations of racism for any and all individuals and groups that raise concerns and point out factual evidence regarding the Obama Administration’s gross violations of existing immigration law and his associated open border policies. This meme is by no means restricted to just editor Shaun Kenney but has been the point of attack by other contributors to the blog as well. Are there among the Gallop poll sampled national majority who oppose these policies some whose motivation is racial animosity, clearly without a doubt, as there are unfortunately, among a growing population of leftists spouting anti-semitism and calls for reintroducing racial segregation by blacks on the modern freedom of speech hating college campuses across our nation. As the issues raised by many opposing the existing immigration policies put in place by executive order mandates not congressional legislation and the feared impacts become a daily occurrence increasing economic depredation to the the American working class and spreading overt terrorist violence in the homeland, these race baiting accusations become more and more what they really are, the complete failure to come up with a cogent argument to support your positions on why these policies are either beneficial or safe for the general public as a whole. When you have no argument to win the discussion resorting to racist labeling is nothing more then an attempt to drive your opponents from the field of discussion. This is a technique that the left employs well to it’s advantage in stifling open discussion as they well realize no one likes being painted a racist even if the accusation is in no way germane to the topic. You don’t win policy arguments with this type of approach you just alienate people. I would think the general loss of influence on shaping Virginia political policy that has occurred at the Bearing Drift would temper Mr. Kenny’s public accusations if not his attitudes but it is often the case the true character of an individual does not come forth in a winning situation but rather when you have clearly lost the argument. I believe Mr. Kenney is better then this and I hope to be proven in the future that is a correct assessment, if not then he deserves our pity. The “Real” Conservative Readers of VARight need to understand what has happened in the Middle East so they don’t fall through the “trap door” laid by BD calling everyone “racist.” A Saul Alinsky tactic. Shaun Kenney is a Christian- has a nice Irish Name. Right? His mother is a Lebanese Christian. Remember that many Maronite Christians fled Lebanon for the religious freedom to be found in America. Most are Catholic. There is a large congregation of Maronite Catholics in Richmond. I know many of them. GREAT awesome people- Conservative Republican Voters like Shaun Kenney. We see this same tragedy leveled against the Christians in Lebanon happening today in Syria. Syrian President Assad is a secularist and allowed the peaceful coexistence of Christians and Muslims in Syria but the War Mongering Globalist RINOS like Marco Rubio and John McCain and Lyndsey Graham and most of the US SENATE and Obama and Hillary Clinton et al wanted to take out Assad. Which created the humanitarian crisis in Syria. Trump is correct when he states Obama and Hillary Clinton created ISIS and the mass migration into the WEST. Of course they did. So now we have a crisis of persecuted Christians fleeing Syria in their civil war where ISIS is murdering them. What happened in Aleppo is a tragedy on the level of the Holocaust. So let’s lay off of Shaun Kenney at BD. We have not walked a day in his mother’s shoes and don’t know the story of their family’s immigration to America. He’s a sympathetic heart to those Christians who want to be FREE in America who are fleeing Religious Persecution. Shaun Kenney is a Christian and a Conservative. We just don’t always like his candidates. First, if you wish to defend a person’s behavior use your name don’t hide behind a pseudonym it doesn’t build your credibility credentials, second the issue regarding the resort to race baiting, which you state up front has a long history on the BD blog has never been about Middle Eastern Christians but focused on commentor’s opposed to the Obama administrations open border immigration policies so your argument is so misconceived it’s hardly worth addressing and finally even Mr. Kenney doesn’t refer to himself as a conservative (what ever that means in Virginia anymore) but rather a moderate Republican. Perhaps if you knew anything factual about the Obama administration’s current immigration policies at all you might realize one of the issue areas those that oppose them find very objectionable is that the portion recently funded by Congress regarding Syrian immigration has so far provided entry to a very small number of Christian families with the vast majority being resettled Sharia supporting, single male Islamists. Something of concern to the prudent of mind regarding what is occurring across Europe with a similar influx of such individuals. That is what is being currently opposed along with the open borders situation and that is what the forthcoming racial epithets are being applied to regarding such out of control, unmanaged, non vetting chaos. I’d thought I’d seen some bad examples of argumentum ad hominem in my time until I read this collection of logical fallacies, regardless of who,has or hasn’t been in someone elses’ shoes. You not only missed the point but you missed the whole issue. You are correct that most (not all) Syrian refugees have been Muslims. You are incorrect that they are mostly “single male”. Very, very few fit that description. Most are women and children. “Unaccompanied males” account for around 2%. Numbers are hard to come by here due to the Obama Administration’s complete reluctance to publish verifiable lists pertaining specifically to legal and illegal (which in my comment I consider one and the same since the current administration certainly does) via both Congressional funded immigration programs and the well organized and profitable Cartel smuggling operations on our southern boarders. The two percent estimate I don’t buy or believe is anywhere close to reality but would like to see exactly who and what is your source of information. Here is granted a piece of time-sliced data (prior to the administration’s hindering of reporting outputs) to put this in some perspective. From October 1, 2010 thru September 30, 2011 the U.S. Border Patrol and the U.S. Customs and Border Protection division of the Department of Homeland Security arrested 327,577 aliens illegally entering the U.S. just along the U.S. border with Mexico (a single year compilation prior to the real ramp up during 2012-2016). Of the illegals captured along the Mexican border, 46,997 were listed as ‘other than Mexican’. Among the “other than Mexican” were people from countries listed as “special interest countries” such as Pakistan, Bangladesh, Philippines, Somalia, Tunisia, Syria, Uzbekistan, Jordan and Indonesia. Looking at the countries of origin, I think it’s safe to assume that many of them were Muslim and very safe to claim almost all primarily young males (which has been anecdotally confirmed by ICE agents) regarding the hardships and difficulty of the crossings. While the exact numbers are difficult to pinpoint (thanks largely to our own government’s unwillingness to share the exact figures) this influx is most certainly NOT a familial based migration any more then it is in Europe where the EU is more open in reporting the exact influx, though with street protests occurring across the region now over the issue, that is changing as well. This isn’t about families as it should be but never has been. Shaun Kenney is the name caller here- calling Mr. White today a RACIST for writing this article. Shaun Kenney didn’t come off the Mayflower. He’s not an FFV with a Country Club of Virginia membership in the Blood Line. We get it. Kenney’s mother is a Lebanese Christian. Wonderful people. Republican mostly…. the Maronites. Kenney’s big mistake was embracing the Muslim Refugees like the Americans embraced the Maronite refugees from Lebanon who did assimilate by the way into our Culture and Language. Mr. Kenney owes all of us from Roanoke an apology. BD is a rag of racism and nasty articles which smear good people and their reputations. And they wonder why the Republican can’t win in Virginia anymore. Look in the mirror guys. There are more Lebanese outside of Lebanon today than within. Lebanese-Americans have also tended to be more Republican than other immigrant groups. Is no one going to bother pointing out that the assailant is a U.S.-born natural citizen, and not a Syrian refugee? Seems directly relevant to your case, no? Here is granted a piece of time-sliced data (prior to the administration’s hindering of reporting outputs) to put this in some perspective. From October 1, 2010 thru September 30, 2011 the U.S. Border Patrol and the U.S. Customs and Border Protection division of the Department of Homeland Security arrested 327,577 aliens illegally entering the U.S. just along the U.S. border with Mexico (a single year compilation prior to the real ramp up during 2012-2016). Of the illegals captured along the Mexican border, 46,997 were listed as ‘other than Mexican’. Among the “other than Mexican” were people from countries listed as ‘special interest countries’ such as Pakistan, Bangladesh, Philippines, Somalia, Tunisia, Syria, Uzbekistan, Jordan and Indonesia. Looking at the countries of origin, I think it’s safe to assume that many of them were Muslim and very safe to claim almost all primarily young males (which has been anecdotally confirmed by ICE agents) regarding the hardships and difficulty of the crossings. While the exact numbers are difficult to pinpoint (thanks largely to our own government’s unwillingness to share the exact figures) this influx is most certainly NOT a familial based migration any more then it is in Europe where the EU is more open in sreporting the exact influx, though with street protests occurring across the region now over the issue, that is changing as well. This isn’t about families as it should be but never has been. Sorry Stephen didn’t mean to bomb you with multiple replies as this was a reply to your comment to me above and inattention resulted in me posting to you twice. Again sorry. If all parties would agree to stop the name calling , which is correctly noted in this dialogue as a tactic employed when one has no argument or is losing the argument we might just make some progress on the substance of the issues. Racist is now in danger of losing all meaning. It has been over employed in far too many cases ,to a point where it is becoming intellectually like the boy who cried wolf one too many times……people just stop believing you. Trump can win the argument on the effects of progressive policies with the facts and the data ( some 50 years of evidence ) the calling Hillary a bigot only muddies the water. All concede we are a polarized nation politically and culturally. A good starting place would be to stop the name calling and the assigning of nefarious motives . Conservatives can win the case on a clear well defined presenting of the facts.